two sectors are particularly vulnerable to the calamitous effects of the crises given the physical and/or mental limitations in their conditions, and the lack of plans and programs for PWDs and the elderly on how to best prepare for and deal with such calamities. 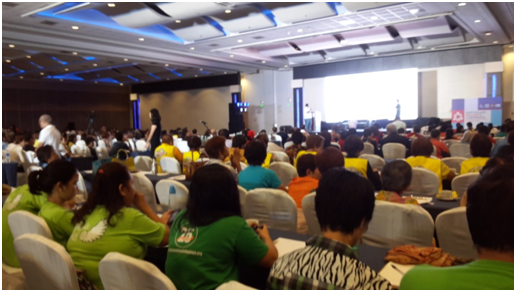 A symposium to present and discuss the issue was held last 29 June 2015 at the SMX Convention Center at the Mall of Asia Complex, Pasay City. Under the auspices of SM Cares in partnership with DOS-PHILVOLCS, NDRRMC and MMDA, the half-day event was called “Earthquake Resilience Conference – 1st Earthquake Conference for Persons with Disabilities” which featured subject matter experts and attendees from Senior Citizen and PWD groups from around Metro Manila. The ASP participants consisted of PWAs, chapter leaders, parents, siblings and service providers. Resource speakers included PHIVOLCS Director Dr. Renato Solidum, Jr., Architect Jaime Silva of the United Architects of the Philippines, Mr. Mark Padil, a Behavioral Specialist from the Autism Society Philippines and Mr. Johnny Yu, Director of the Manila Disaster Risk Reduction and Management Council. Their highly informative presentations expounded on the nature and hazards/risks involved during earthquakes, as well as recommended course of actions our PWDs and senior citizens can do during such eventualities. Mark Padil for his part detailed on Persons with Autism (PWA) specific behaviors and practical response options for emergency assistance workers tending to PWAs. The conference included an open forum session where a number of senior citizens and PWDs were able to ask questions. A small section in the venue displayed Personal Protective Equipment (PPEs) and paraphernalia recently acquired by the city of Manila for its Disaster Risk Reduction and Management Council unit. Towards the conference close, all participants received emergency preparedness tokens courtesy of SM Cares Foundation consisting of an information card, whistle and small flashlight. One brief video presentation during the event, the March 2011 earthquake and tsunami that struck Japan, emphasized on the need for PWDs’ inclusion in the overall disaster risk management plan and program of every community. Bringing this forward by way of this earthquake resilience conference is one major positive step toward this end. This article is a contribution from Mr. Al Pena -- the “First Gentleman” to ASP’s immediate past president Jan Pena. Where can i get a video copy of the lecture on earthquake preparedness as well as the emergency kit?